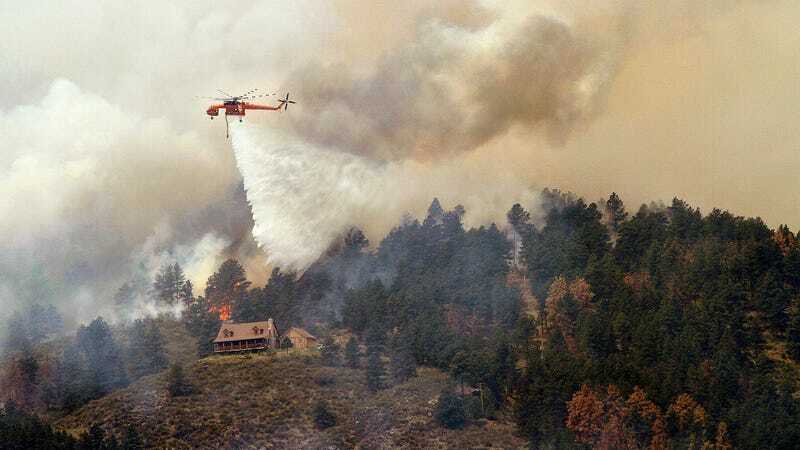 The High Park Fire in Colorado in 2012. I dare say 2018 will be the year of climate litigation. In Colorado, the city of Boulder, as well as San Miguel and Boulder counties, filed a joint lawsuit Tuesday against ExxonMobil and Suncor Energy. It’s the first such litigation to come from a non-coastal state. Why? For the corporations’ alleged role in “causing, contributing to and exacerbating climate change,” per the 109-page complaint filed in the Boulder County District Court. Their requests? That these companies pay up to help mitigate the impacts of climate change on these regions. After all, some oil companies (like Shell and Exxon) knew about climate change since the ’70s, according to this comprehensive timeline, and despite their knowledge worked tirelessly to build a climate denial campaign that’s really at the root of the current state of climate denial in the U.S. These Colorado hoods aren’t the first to sue oil giants. Exxon, in particular, is dealing with some serious litigation on behalf of major cities like New York and San Francisco and Oakland in California. Other major companies, like Chevron, BP, and Royal Dutch Shell, are also facing litigation. Companies are starting to get salty about the lawsuits, with Chevron even trying to sue another oil company in Norway, Statoil. Really, dude? What does make this Colorado lawsuit stand out, however, is that, well, this isn’t a coastal region. In places like New York City and San Francisco, lawsuits tend to highlight the impacts of sea level rise. But that’s just one way the world will experience climate change. Some California counties have taken legal action after seeing firsthand what their wildfire seasons will look like in the future. Wildfires, drought, and even flooding are all shouted out in the complaint. So are the state’s $41 billion agriculture and $5 billion ski industries, both of which are threatened by rising temperatures. And, of course, there’s health: Climate change affects air quality and the spread of disease.